Apple’s blockbuster Q4 pushed the company’s valuation to $900 billion, but it also saw the firm return to growth in key market China following a challenging past couple of years. 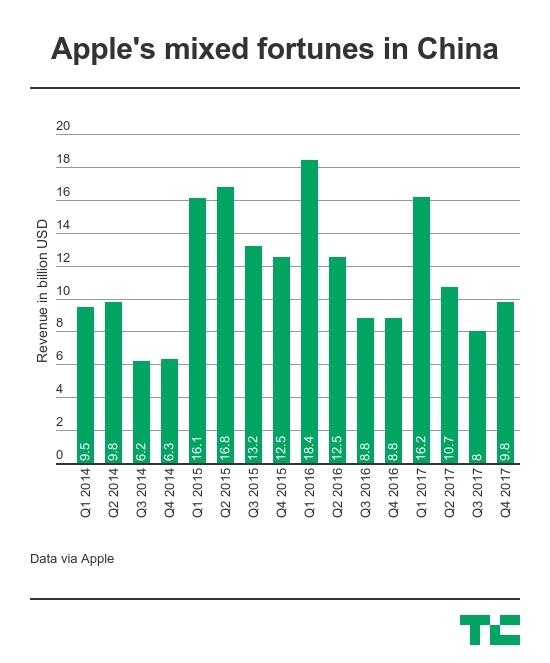 Analysts already reported that Apple saw shipment growth in China during the last quarter with a 41 percent increase, but now the company’s latest financial report confirmed that revenue was up, too. Total sales in Greater China — the region that Apple defines as China, Hong Kong, Singapore and Taiwan — grew by 12 percent year-on-year to $9.8 billion. That figure was up 22 percent quarter-on-quarter. An increase in iPhone sales thanks to the newly-released iPhone 8, CEO Tim Cook told investors in an earnings call that Apple sold a record number of Macs during the quarter. Likewise, earnings from services — where Apple made huge strides globally — also hit at an all time high. “We increased market share for iPhone, Mac, and iPad during the quarter. We hit all-time revenue records for services — for Mac and for the PRC during the quarter. We had very strong iPad revenue growth. We had double-digit unit growth iPhone and both the upgraders and Android-switchers were both up on a year-over-year basis during the quarter. And so the results were broad day,” Cook said in response to one question. While growth is of course positive, Apple’s China revenue was still some way short of its peak two years ago, when the iPhone 6 and iPhone 6 Plus — the firm’s first phablet-sized devices — helped revenue jump to $12.51 billion. Analysts are less sure on the impact that the iPhone X will have in China. While it has generated attention for a design that represents a clear departure from other devices — and emphasizes luxury, a point that has served Apple well with previous phones — opinions are divided on whether a starting price of $1,000 for the cheapest model and limited supply will play out in Apple’s favor.